Sally Cameron is a holistic health coach and professionally trained chef. Sally provides health coaching services that advise people on how to eat, cook and live more healthfully, achieve their optimal weight, and reduce their dependence on sugar. Sally writes the popular food blog, A Food Centric Life, where she shares healthy recipes for ever day and easy entertaining. You can also find her on Facebook and Twitter at @foodcentriclife. 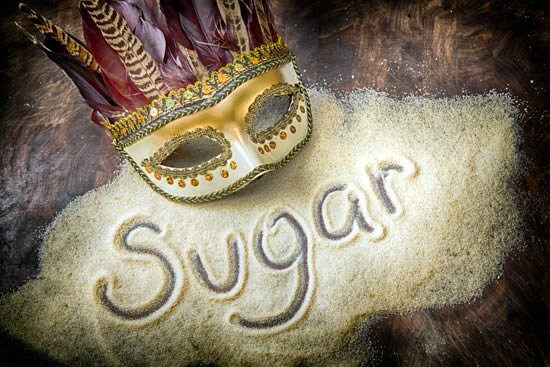 Masked by many names, sugar quietly and dangerously hides in our diets. We need to seek out the hidden sugar in order to make healthier choices and live healthier lives. To do that, we must know the names sugar goes by. Sugar is one of the most refined foods we consume daily, and it’s a marker for processed foods in the American diet. Our sugar consumption has gone from a few teaspoons a week in the early 19th century to 100 pounds a year today. Frightening statistics. No wonder America has health and weight problems. And all of those extra sugar calories have no nutritional benefit. But We Need Sugar, Right? Sort of. Most of what we eat turns into sugar – or glucose – through digestion. Glucose is our body’s main fuel for energy. But there are good and bad ways to obtain it. The good: fruits and vegetables, whole grains and whole foods. The bad: sodas, sweetened drinks, processed, packaged, and fast food, many condiments, white rice and flour. Sugar is sweet, tasty, and unfortunately addictive. Something food manufacturers know. If a product is sweetened, it will sell more, so sweeten away they do so the unaware public will consume more. Start reading labels and you’ll be shocked. Consuming too much sugar has severe health consequences. Sugar consumption has been linked to obesity, diabetes, heart disease, hypertension, and cancer. It negatively impacts cholesterol and triglyceride levels in our blood. According to Dr Daniel Amen, sugar is pro-inflammatory, a reason for chronic disease. Amen says, on sugar, your brain does not work as well. And did I mention it’s addictive? Sugar hides behind many masks so we must learn to read labels. Sugar shows up as sucrose, dextrose, fructose, maltose, lactose, glucose, levulose – anything that ends in -ose. Beware also of barley malt, molasses, honey, cane juice, high fructose corn syrup, corn syrup, corn solids, evaporated cane juice, maple syrup, fruit juice concentrate, sorghum, agave, rice syrup, date sugar, caramel, and many more. It’s not always understandable that you are eating sugar. Sadly, sugar is everywhere. 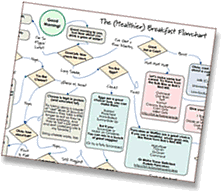 Anything that ends in –itol, like xylitol, mannitol, sorbitol and others are sugar alcohols. Sugar alcohols are carbohydrates and for some can cause gas, bloating and other intestinal issues. Sugar alcohols are commonly used in “low-carb” or “sugar-free” processed foods. Besides soda and sweetened beverages, cookies, ice cream and frozen yogurt, pastries and baked goods, you’ll find sugar hiding in condiments like ketchup, barbecue sauce, pasta sauce, salad dressings, jams and jellies, flavored yogurt, breakfast cereal, granola bars, juices and juice concentrates. Don’t fall for the “natural” label; read the label for yourself. And that fancy coffee drink? Look out, big time. You must read labels, because sugar hides in many packaged, processed and prepared foods. If you think that using artificial sweeteners will help in your quest to reduce sugar, think again. There are five currently approved by the FDA. They are Aspartame, Saccharin, Sucralose, Acesulfame K, and Neotame, but there are issues. According to the National Cancer Institute, there is no clear evidence that artificial sweeteners used in the US are related to cancer risk in humans. However, The center for Science in the Public Interest (CSPI), cautions everyone to avoid aspartame (sold as NutraSweet and Equal) because it contains three well-recognized neurotoxins which have been associated with thousands of reports of adverse effects. For the list of symptoms, read this article by Dr. Annemarie Colbin. How much sugar can we safely consume? The American Heart Association recommends that women consume no more than 6 teaspoons of added sugars a day (25 grams) and for men, no more than 9 teaspoons (37 grams). One teaspoon of sugar is equal to 4 grams or 16 calories. It’s not the natural sugars found in fruits, vegetables, low fat dairy and whole grains most people need to be concerned with, but the added sugars in foods we consume. The best way to get sugar under control in your diet is to reduce (or eliminate) packaged, processed and fast foods, soda and sweetened drinks and beverages of all kinds. Cook more at home with whole, fresh foods. To help tame a sugar craving, add more fruit and sweet vegetables to your diet. Sweet vegetables like carrots, sweet potatoes and yams, sugar snap peas, sweet onions, corn, as well as butternut and other winter squash varieties. Some vegetables are subtly sweet, like turnips, parsnips and rutabagas. Try these easy recipes for roast carrots with thyme and whipped sweet potatoes with rosemary. They will help get you started. A note on labels. Unfortunately today’s labels do not differentiate between natural sugars and added sugars. Don’t worry about the naturally occurring sugars; weed out the hidden sugar. Use your head in making smart choices. Eat more food grown on plants and less food made in plants. We all enjoy a sweet treat now and then, and that’s ok. Will the occasional treat ruin you? No, but we must be aware of how much we consume and the sources, being sure to exercise off those extra calories. Learning more about sugar in our diets will help us make wise choices and help us enjoy that occasional treat without endangering our health or our waistlines. If you need suggestions on taming your sugar addiction, here is a great article. Additionally, this is something I help clients with in my health coaching practice. If you are interested, please contact me for more information. Thank you, Sally! I’ve recognized for some time that eating sugar leads to sugar cravings and eating more of it. It’s a nasty cycle. I recently quit added sugars cold-turkey and found myself actually feeling irritable and a bit depressed, which is totally opposite my personality. This unprocessed challenge has helped me get the last bits out of my diet. (I LOVE ketchup!) The longer I go without sweets, the less I want them. Cheryl – If you love ketchup, try making homemade! it’s delicious and you can control the ingredients for your tastebuds and your health! Here is a good starter recipe from my friend Susan at The Urban Baker http://www.theurbanbaker.com/homemade-ketchup/. I’ve started with this recipe and adapted for my desires. Good luck! Really appreciate the excellent material submitted to this site on a daily basis. HA HA I agree with Cheryl… this challenge I quit ketchup… I love it. I too was cranky off and on for the first 2 weeks… but I feel great now. I started early and on Day 26…. and I plan to do 60 days! Cheryl and Becky, some people do experience that cranky feeling when they quit sugar. Hang in there. It will pass, then you will feel great! That’s terrific Sunny. Good for you! Thanks for sharing your experience!